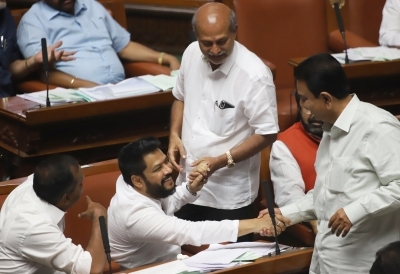 Bengaluru, Feb 13 (IANS) Four 'rebel' Congress legislators, who defied the party whip to absent themselves from the budget session since February 6, came to the assembly on Wednesday and were seen sitting on the treasury benches. "All our four legislators -- Ramesh Jarkiholi, Umesh Jadhav, B Nagendra and Mahesh Kumatalli - returned to Bengaluru on Tuesday night and attended the session today (Wednesday), sitting along with our party members," a Congress leader told IANS here. Congress Legislature Party (CLP) leader Siddaramaiah had on Monday petitioned Speaker K.R. Ramesh Kumar to disqualify the four under the anti-defection law for skipping the session for five days since February 6 in defiance of the whip and two notices served on January 18 and February 8. "The legislators' return is timely, as the assembly is set to debate the budget (presented on February 8) and vote for passing it," said the Congress leader. Denying that they were in touch with BJP to join the party, the legislators said they would not resign from the assembly or the party. "As I had written to Siddaramaiah in response to his February 8 notice. I could not attend the session since February 6 as I was indisposed and in hospital," said Kumatalli. Chincholi legislator Jadav told reporters outside the assembly building that he could not come to Bengaluru for the session till Tuesday as he was pre-occupied with constituency work. Though the rebels responded to the notice Siddaramaiah served on them for skipping the session till Tuesday, the latter earlier said the unanimous opinion of the CLP was for legal action against them under the anti-detection law, as sufficient opportunity was given to them to fall in line. In the 225-member Assembly, including one nominated from the Anglo-India community, the Congress has 80, including the Speaker, the Janata Dal-Secular 37, the BJP 104 and remaining are an Independent and one each from the Bahujan Samaj Party and regional outfit KPJP.